There is no doubt that our Earth is dying. Day after day, hour after hour, the Earth nears its end, just like all humans and every living being shall inevitably meet their end. But no one can with exactitude say when the final Hour shall occur. Only the Almighty, Allah (twa) owns information about it and has not disclosed it to anyone, even His closest and most beloved of all prophets and creatures, the Holy Prophet Muhammad (pbuh). They ask you about the Hour: when is its arrival? They ask you as if you are familiar with it. The Bible also makes clear that only God Almighty knows the timing of such, and anyone who makes such a prediction (claiming that he knows the time of the Hour) acts contrary to the Word of God. The Day of Judgement or the Hour can be interpreted in many ways, but what I’m saying here concerns the final destruction of the Earth and all people thereon. Every person has his own final hour. His death is his final hour. Death in an earthquake is tantamount to the final hour of the dead people. Everyday millions of people die, and for them this is clearly their final hour, for the process for their journey to the hereafter and their judgement before their Lord therefore begin. Two years ago, on 02 November 2013 (28 Dhul Hijjah 1434 AH) I made a short speech on the speculation among Hindus and Tamils ​​on total or hybrid solar eclipse that was to take place the following day on Sunday 03 November 2013 for their Diwali festival (festival of Lights). This time though, during the night of Sunday 27 to Monday 28 September 2015, the full moon passed through the shadow of the earth. On Sunday 27 September in the late afternoon just before sunset, a beautiful and big full moon rose above the horizon, triggering the “Super Moon” phenomenon. What is a super moon? It’s a new or full moon closely coinciding with perigee – the moon’s closest point to Earth in its monthly orbit. Due to its closer position to the earth, its perigee, within 357,000 kilometres away, allows the moon to give us its biggest apparent diameter of 33.5 arc minutes, or 0.56 degree. The beginning of the eclipse is when the moon covers the area of ​​darkness that surrounds the Earth’s shadow-cone which is the region of space where the sun is partially hidden by the earth. The decrease in brightness of the lunar surface is progressive as it sinks into the darkness. The event becomes much more attractive when the moon comes into contact with the edge of the Earth’s shadow. The black notch that materializes on the lunar limb is thus quickly visible north of the (lunar) ocean located west of the visible side of the Moon. The Moon, the natural satellite of our beautiful planet Earth then lies about forty degrees high above the south-southwest horizon, that is to say almost halfway between the horizon and the zenith. Thus, on the night of 27-28 September, there has not only been a super moon but a super moon which has been totally eclipsed in some specific parts of the world, such as major superpowers as America, the United Kingdom, France etc, thus triggering what is called also a Blood Moon (Red Moon). Thus came what is called a Super Blood Moon which is extremely rare. 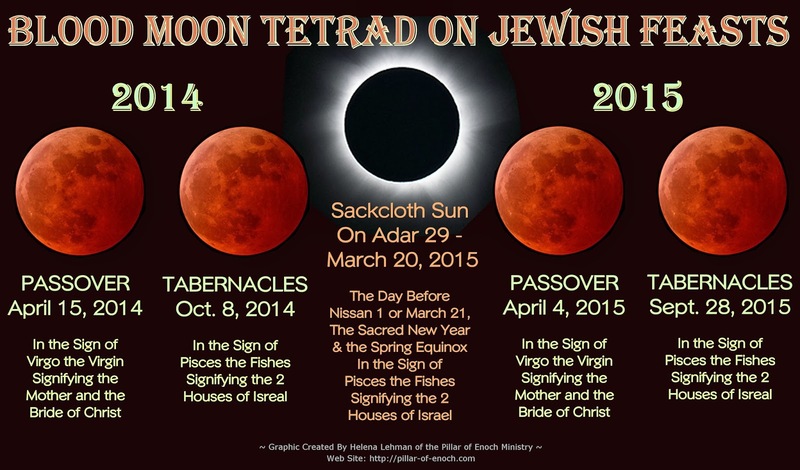 In two years, there was also a lunar tetrad (equivalent to a series of four total eclipses of the Moon in the space of two years) that awakened the conscience of the Jews in particular because this lunar tetrad (and moreover blood moons) manifested during the Jewish sacred days. What is most striking in all this is that in the middle of the four Blood Moons, there was a total eclipse of the Sun (20 March 2015). 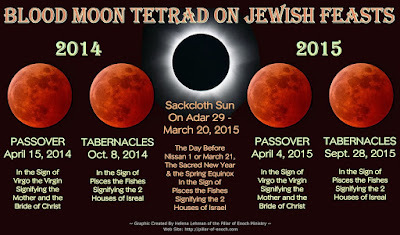 Lunar Eclipse of 15 April 2014 (Jewish Passover), Lunar Eclipse of 08 October 2014 (Succoth), Solar Eclipse of 20 March 2015 (just before the start of the religious year), Lunar Eclipse of 04 April 2015 (Jewish Passover) and Lunar Eclipse (Super Blood Moon) of 28 September 2015 (Succoth). 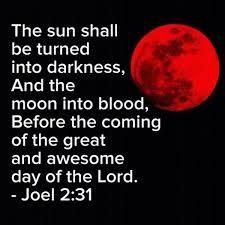 According to the prophecy stated this verse of the Holy Quran, the heavenly signs consisting of the eclipses of the moon and sun will mark the advent of a messenger of God. The Bible and other scriptures also make mention of it. God will manifest signs in large numbers to certify the authenticity of His Messenger. A messenger of God is the one who claims to be a recipient of divine revelation similar to the prophets. Having perfected the religion of man with the advent of Islam, God will send such reformers and prophets who shall have the hard task of ensuring the preservation of Islam among the people of the earth until the Day of Judgement. These reformers (messengers) will not have the flexibility, the permission to create a new religion, but they will be obliged to submit to the immutable requirements of the Holy Quran, which is the pure revelation, free from all human interpolation. Following the divine directives and in concordance with the universality of the prophethood of the Holy Prophet Muhammad (pbuh), the prophet-reformer of his time announces to the world that a single reformer (in his lifetime) will be appointed to embody all (elects) who have been announced in the great religions. In other words, he shall follow the footsteps of the prophet of Islam, the only religion that teaches, in its Holy Book, the belief in all the prophets, without distinguishing between them. A reformer also presents the world a harvest of his own prophecies whereby some are fulfilled during his lifetime and others later and these prophecies shall come to be fulfilled even till the Day of Judgement. The Almighty and Omnipresent God always keeps His promises and treats His sincere servants with love and in accordance with His promise and the prophecy of the Holy Prophet (pbuh). And by the grace of Allah (swt), I came as such in this century to confirm the past prophets and reformers and fight with my body and my soul to let shine the religion of God and His unity around the world. To this end, Allah gave me many revelations that clearly dictate my mission and ordered me ever since the year 2003 to proclaim this mission and my identity as the Chief Elect and Messenger of God to the world. To support the official claim of a reformer there are many arguments and many heavenly signs. In addition to the eclipses of the sun and moon which have been manifested in November 2003, the total eclipse of the Super Moon which happened on Monday 28 September 2015 is also a sign in support of my coming and this sign is not only for Muslims but for all people of the earth to make them see how God Almighty is supreme, and He made them witness this not once but many times since the beginning of this century. The manifestation of such eclipses took place in this century to prove the truthfulness of this humble servant of Allah (the Khalifatullah of this era) so that the peoples of the East and West, of the ancient and new world can witness the power of God and the truth of this humble servant of Allah. Many people have claimed that these specific signs are natural phenomena. But the sun and moon did not bear witness to the truth of the elects (of God) except in the case of the Promised Messiah Hazrat Mirza Ghulam Ahmad (as) in the year 1894 (Thursday, 21 March and Friday, 06 April 1894) and this humble servant of Allah (the Khalifatullah) in early 15th century AH and also recently in November 2003 (9 and 23 November respectively). It’s enough to make you think objectively about the claimant, and most certainly this humble one, the Khalifatullah of this century has brought you the message and to bear witness to the truth which the sun and the moon both testified and the heavenly signs continue to make people of the Earth and all communities to reflect on the coming of the Awaited One who shall get them out of darkness and bring them into the Light. May Allah Almighty open the hearts of the true seekers of truth, those who are sincere in their quest for divine truth and may they get the blessing in this century to belong to the circle of elected followers of the Khalifatullah of this era (this humble self). Ameen.